This page was added by Website Administrator on 21/07/2014. The children in this photo are my great aunts and my grandpa. 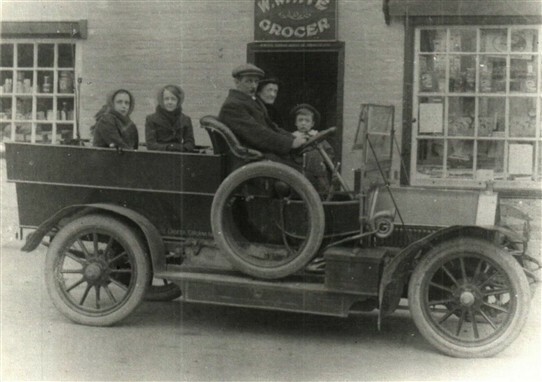 Brian Waters, author of a book on motor cars made in Nottinghamshire (titled "Made in Nottinghamshire") comments that the car in this picture is a Humber and most likely a product of the Beeston factory. If so, with the long chassis, it will be a 30hp car of c1905, and no later than 1908. The car has certainly had the coachwork altered later in in its life, with a rear trap style body, side seats for about six passengers and a rear entrance. I think the conversion was made to provide a people carrier rather than a delivery vehicle, although it could be both. With the "battered" appearance of the Humber, (note the mudguards), I think the photo was taken much later, possibly c1920.